Top: Immerse Bahamas President & CEO Ginger Moxey, left, paid a courtesy call to Prime Minister Perry Christie on Monday and presented him with a copy of the first edition of her magazine, ‘Immerse’. 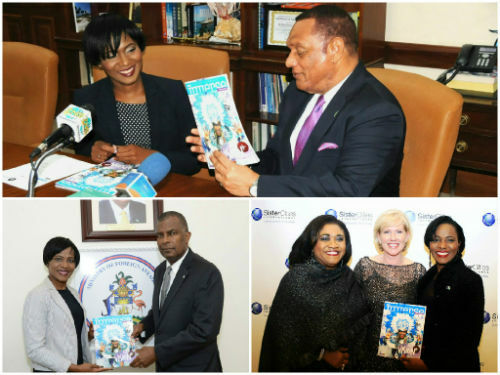 Bottom left: Minister of Foreign Affairs & Immigration received his copy of the ‘Immerse’ Magazine from Immerse Bahamas President & CEO Ginger Moxey while Minister Mitchell was in Grand Bahama last week. Bottom right: 'Immerse' Magazine was launched in Washington earlier this month at the Sister Cities International Gala at US Chamber of Commerce. From left are Mary Kane, President, Sister Cities International; Paulette Zonicle, Bahamas Consul General, Washington DC; and Immerse Bahamas President & CEO Ginger Moxey. Freeport, BAHAMAS – Immerse Bahamas, Grand Bahama’s newest public relations, project and destination management company, has launched its new magazine featuring ordinary Bahamians who are doing extraordinary things. Immerse Magazine is a compilation of all things Bahamian; the people, the culture, the communities and the experiences. “It tells the untold stories of some who are known, and often many who are unknown; the young and the not so young; the newbies and the legends; the islands and the culture. We capture and covey, the heart, soul and spirit of The Bahamas,” Immerse Bahamas President & CEO Ginger Moxey said on the launch of her new magazine. On Monday, March 23rd, Ms. Moxey presented Prime Minister Perry Christie with the first edition of her magazine when she paid a courtesy call at his office. He was impressed with the publication and wished her well. “Immerse Magazine a vehicle to share The Bahamas with the world, and the world with The Bahamas and focuses on relationship building and partnerships with international organizations and people all over the globe,” Ms. Moxey said. Excited about the new venture, the Grand Bahama entrepreneur also noted that the inaugural edition of Immerse Magazine focuses on ‘The Grand Life’ of Grand Bahama Island. “There are so many stories to tell of our people; so many diverse islands to be discovered and partnered with cities around the world; so many people determined to come together in unity to explore each other’s culture; and so many opportunities for business, educational, tourism and humanitarian exchanges,” she said. The Magazine’s mission is to become the premier magazine for local airlines; an in-office companion piece for Bahamas Government offices and Bahamian businesses abroad; a promotional piece for trade shows, exhibits and promotions that feature The Bahamas throughout the world. The 100-plus page, full color magazine is also geared toward promoting domestic tourism throughout The Bahamas and will be published quarterly. Ms. Moxey, who is the former vice-president of the Grand Bahama Port Authority, the regulatory entity and managers of Freeport, stepped down last year to begin a new chapter in her life and created an organization that provides a vehicle for entrepreneurs. The Magazine will be available at Bahamas offices around the world, including embassies, consulates, tourism offices, as well as international organizations.